Emmetts is a popular National Trust Property, set within an Edwardian estate and hillside garden in the Kent Downs AONB. We undertook a landscape and visual effects study and design work for a new visitor centre and associated access and car parking to accommodate increasing visitor numbers and enhance the visitor welcome and facilities on offer. The design proposal addressed the challenging constraints of this sloping site in the AONB and Metropolitan Green Belt which lies adjacent to Ancient Woodland and a Site of Special Scientific Interest. Working closely with several key staff at The National Trust, we were able to create a design that was responsive to the needs of the Trust as well as the site constraints. The proposed layout of the car park required minimal tree loss and accommodated the new building whilst allowing for three coaches to turn freely and park close to the entrance. Access for a mobility buggy for less able visitors was enhanced, and a new plant sales area created. Rainwater harvesting and permeable surfacing were incorporated into the design to reduce the environmental impact of the building. 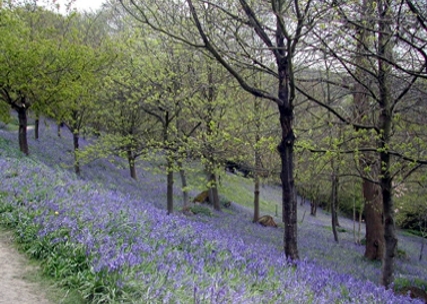 The use of native species in the soft landscape design provides wildlife benefit and will, in time, help to integrate the setting of the car park with the adjacent ancient woodland.